Meshad oriental rugs have been continually produced in the Meshad district of NE Iran for centuries. Meshad is the capital of the province of Khorassan. At one time, rugs from Meshad were called Khorassan rugs. The finest Meshads were also known as Isfahans but they were in no way similar to the rugs that are actually woven in the neighboring city of Isfahan. Rug weaving in the Meshad district can be traced back to before the mid-1500s. The district was a major oasis on the famous Silk Road, the ancient network of trade routes which ran 4000 miles from China and India to the Mediterranean and connected the East to the West. Meshad today is a prominent center of the rug weaving industry in Iran. It is considered a holy city to practicing Muslims because it was home to the eighth Imam (religious leader) who is buried there. Millions of Muslims make the pilgrimage to Meshad every year. Today, the city has a population of over 3 million and is the 2nd largest city in Iran. It is also one of the best wool producing regions in the country. The most common design of Meshad rugs is curvilinear, featuring a large central medallion on a magenta colored field and corners filled with floral designs. Vines and flowers also fill the field. The central medallion is called the Shah Abbas. It is an intricate pattern that is used to cover the field of a rug. It consists of intertwining tendrils and vines with palmettes and rosettes and can also feature vases and cloud bands. Other motifs used by the Meshad rugs besides the Shah Abbas include the boteh and herati motifs. These motifs are smaller than the large central Shah Abbas motif and are used in a repeating, all-over pattern. The wefts (side to side cords) are also cotton and are sometimes dyed gray. (Antique Meshad rugs had blue wefts). The insertion of the wefts is also unusual and inconsistent in these rugs. There are usually 2 weft cords inserted, alternating across the warps as would be expected, but sometimes there are no wefts or one or 2 sinuous (non-straight) wefts between every 3-4 rows of knots. Additionally, two or more wide cable wefts may be inserted, but not alternating between the warps, which creates a trench across the width of the rug on the back. This produces a distinct pattern that can easily be seen on the back of Meshad rugs. 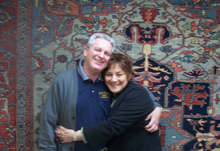 To learn more about Meshad Persian oriental rugs with photos, please continue reading here. Moroccan rug problems have plagued the weavers and their rugs from the North African country of Morocco for a very long time. No matter how beautiful or unique, the Moroccan rug has not been a favorite of professional rug washers either. Some Moroccan rug problems can be caused by low quality wool, which can lead to continuous shedding and possible moth infestations. Unfortunately, noxious odors have also been found in these rugs. 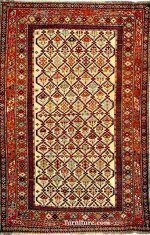 The odors can actually cause allergic reactions to the weavers as well as the owners of the rugs. Dye bleeding or color run is also a well-known problem with Moroccan rugs. WHY DO THESE PROBLEMS OCCUR WITH MOROCCAN RUGS? The answer to why these problems occur with Moroccan rugs lies in the way the artisan economy is structured in Morocco. The artisan weaver is at the very bottom level with the middleman taking most of the final selling price of a rug. Some weavers never even see payment in cash, only in more material to make their rugs. Since the labor cost is so low and the demand for Moroccan rugs is high, the competition is very strong. Thus the middlemen must focus on cutting costs further by sourcing the cheapest material possible as well. Even if this means importing synthetic material from countries such as India and China or taking a number of shortcuts during production. One shortcut example is the use of toxic chemicals to cut the time it takes to properly dye the rugs, causing allergic reactions and noxious odors. CONSUMERS--BEWARE OF MOROCCAN RUG PROBLEMS! Surprisingly, Morocco actually abounds with natural materials as used by the original Moroccan artisans. Excellent wool and natural dyes could readily be sourced locally, but the middlemen control the market. They will not pay the price for natural products and the artisans do not make enough from the middlemen to buy their own. The shortcuts used by the middlemen in the sourcing of wool and dyes have led directly to the Moroccan rug problems with the production of poor quality rugs made with poor quality materials. This is what happens when buyers and sellers deliberately devalue the worth of artisans for their own personal greed. The end consumers of these rugs should be educated to know the facts and learn to determine the difference between poor and excellent quality rugs and the materials used to make them before considering a purchase. Find out what the 3 major Moroccan rug problems are, how to recognize a good quality rug, and where to buy safe, good quality Moroccan rugs. Please continue reading here. Who hasn't needed a paint spill cleanup? So many of us are Do-It-Yourselfers, especially when it comes to painting projects. We bring home our favorite paint chips and maybe even small jars of paint in order to choose the perfect colors. We raid the paint section of our local hardware or big box store for just the right types of paint brushes and buckets. We don clothes we don't care about, move as much as we can out of the way, and cover everything else with tarps before we begin our work. But disaster can strike no matter how prepared we are! Paint brushes can slip right out of our hands. Buckets full of paint can be accidentally tipped over. If it can happen, it probably will! So an important part of prevention is being prepared just in case a paint spill cleanup becomes necessary. When it comes to a paint spill cleanup, the most important rule to remember is to start the cleanup while the paint is still wet. Paint that has dried can be almost impossible to remove completely, even by a professional. Scoop up as much of the paint as you can using a smooth object such as a spoon or a piece of cardboard. And always scoop from the outside to the center (as you would any spill) in order to avoid make the spill bigger. WHAT TO DO WITH HOUSEHOLD ITEMS THAT HAVE UNWANTED PAINT ON THEM? If the item is a piece of clothing or a cushion cover or curtains or drapes, take it as soon as possible to a dry cleaner. If it is an area rug, take it to a rug cleaning plant ASAP. If the textile can be washed in a washing machine you may want to try that. When cleanup involves upholstery, make sure the fabric is water cleanable. If it is, remove the excess wet paint and mix a solution of 1 part cold water to 1 part dish washing liquid (such as Dawn). Sponge the spill, then rinse until all the paint is gone. As a last resort you may try blotting with acetone (main ingredient in nail polish remover). If there is any doubt as to the DIY cleaning of your upholstery, call a professional upholstery cleaner to take care of the paint as soon as possible. When cleanup involves wall-to-wall carpet, only try to clean it yourself if the amount of paint is small. A large area will need a professional cleaning and your diluting of the spill will only push some of it deeper into the carpet. If there are only some small spills, try putting ice on them and you may be able to peel them off. With some carpets you may be able to use a razor to shave off the top of the carpet to remove the paint. Your best chance for removal is with a professional carpet cleaning done as soon as possible. Try to keep the area wet, if possible, with wet paper towels or cloths. To find out how to clean up different types of paint spills, please continue reading here. MINIMUM in plant cleaning of $150. 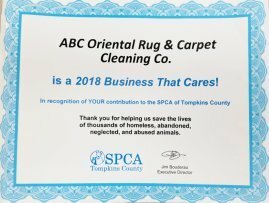 MINIMUM cleaning of $300 for rugs picked up and delivered outside of Tompkins County. **Our Pickup and Delivery area has expanded so please check with our office to see if your area is included.